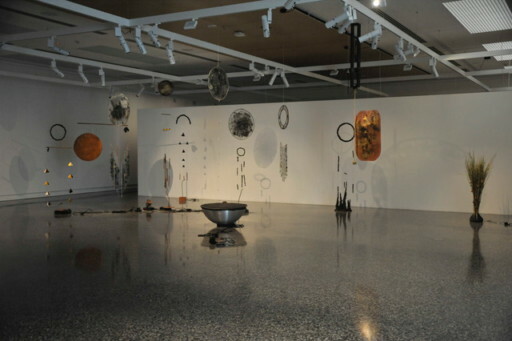 Recently I’ve been working closely with the two Sydney-based artists, Vicky Browne and Pia van Gelder, on projects such as Material Sound, shown at MAMA in Albury, Australia and a forthcoming project at the Black Mountain College Art Museum and Arts Centre. What draws these two artists together for me is that they both make media art installations that are handmade. Media art is not usually thought of as handmade or even as particularly tactile, yet these two artists make work not just in an analogue manner but in a fashion that might be compared to craft. In a warehouse space that reminds me of the 1990s in Sydney (dark, lived in and smelling of smoke), Pia van Gelder sits to perform in front of very little. That is, she doesn't have any instruments, analogue equipment such as her usual modular synth or a laptop. Instead, she has a sectioned box full of electronic components, an empty breadboard or two, plus a mixing desk. The performance begins with Pia making a basic synthesiser from scratch. As she adds components, sounds start being produced becoming more interactive as layers of sounds are built up. For example, a light sensor is added, and a strobing LED is brought into the system to rhythmically activate synthesised sounds. The performance is incredibly risky as breadboard circuits are notoriously unstable. Thus, Pia performs instability and indeterminacy over the course of twenty minutes. There is no room to perfect or stabilise the instrument. The audience watches and hears the fruits of her labour as they are put together. At one point, after having deftly built her system, Pia stops and rests her head in her hands, allowing the system to generate and develop its sounds unhindered by the artists tinkering. While the sonic outcome is not unlike a modular synth performance, the sounds are electronic and straightforward in their range, the effect of watching an instrument being built is surprisingly mesmerising. I’ve written elsewhere about digital fatigue and a return to handmade systems in media art production. The dream of pure transparent audio, created in the vacuum like surrounds of the digital or virtual studio has been jettisoned by these artists who look for noise in the sound and the systems. 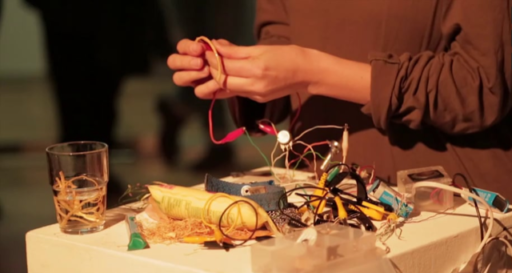 The temporary nature of the breadboard circuit allows for experimentation, and at the end, her work is simply dismantled and returned to the components’ box. Vicky Browne has always worked with handmade media, a practice in which she creates installations that only just continue to work, always on the cusp of breakdown. In her work Cosmic Noise (2018) objects are imbued with a sense of nostalgia for a simpler time when the belief in a cosmic eternity that included humans was still viable. In this time visions of and from space were significant in that they allowed us to see humanity as being a part of the vastness of the universe. The installation suggests an astronomical explosion, the big bang, that leads us to the celestial notion that life exists throughout the universe, held within space dust, meteoroids and far-flung planets. Noise, on a cosmic scale, is vastly different to the small sounds heard within Browne’s installations. 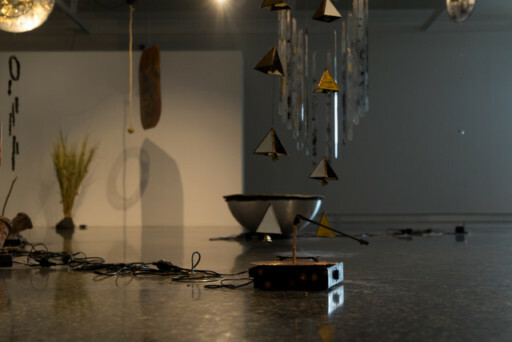 We come to know Browne’s materials through their sound, her objects producing unexpected sounding outcomes and in doing so, the known and expected sound of the object becomes unknown and unexpected. On entering the gallery, we hear before we can see and in Cosmic Noise what we hear is an orchestration of small barely audible noises. We can listen to the work as a sonic whole, or we can enter the installation and focus our attention on specific and often minute sounds. Each element of the work has its own micro-ecology. For example, a turntable plays a copper record, on which are the sounds of bells and birdsong, through a speaker made from sticks. As the platter spins a branch attached to the centre spindle slowly and gently taps metal pipes that hang from the ceiling. Live and recorded sound mingle. Some parts of the assemblage do not make any sound; instead, they draw on the overall sonic nature of the installation to allow us to imagine the sounds. A glass disc covered in powered ink, suggestive of an explosion, from which is hung fragile glass shards, slowly spins. Nearby, a metal drum with a leather skins plays itself, beating dully it bounces powder off its surface. There's a story I often tell about a work of Vicky’s arriving for an exhibition in an art museum. The conservators were aghast to find that the work had been damaged in transit, a leg on a stick microphone's stand had broken. On asking Vicky what they should do she casually explained they should replace the snapped stick with a new one from outside. These works are not precious, but it is in their fallible and fragile form that much of their fascination is formed. The audience watches the distinctly handmade copper record revolves around hitting blackened stoneware hanging precariously above.